Lloret de Mar is a Mediterranean coastal town in Catalonia, Spain. One of the most popular holiday resorts on the Costa Brava, it is 40km south of Girona and 75km northeast of Barcelona. With a population of 39,363 in 2009, it is the second largest town in the Selva comarca of Catalonia.Lloret de Mar attracts summer visitors on package tours. 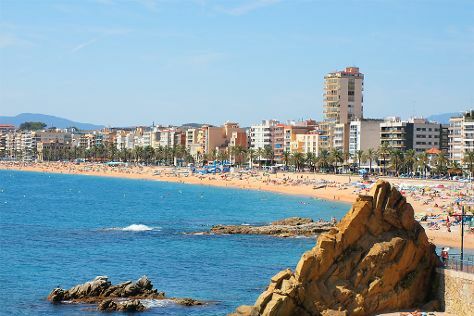 Its main beach (length: 1,630 m; width: 45 m; small, gravel-like stones) is one of the most popular Costa Brava beaches and is consistently awarded the Blue Flag for cleanliness.GeographyThe town of Lloret de Mar covers 48.9km has 9km of coastline and 27km of forest. It borders Vidreres and Maçanet de la Selva to the west, the Mediterranean Sea to the east, Tossa de Mar to the north, and Blanes to the south.ClimateLloret de Mar has a coastal Mediterranean climate, with temperatures always much softer due to thermal effect moderator of the sea. Nevertheless, it should be taken into account that the Mediterranean is a warm sea all year round, which means that the characteristic moderation of temperatures is more noticeable in winter than in summer. The summer dry period normally lasts three months and the maximum rainfall occurs in the autumn months. Lloret de Mar is in Costa Brava. Make Lloret de Mar central to your Spain travel plans using our Spain trip itinerary maker website .